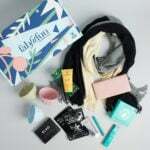 Fancy Box is the original subscription box from Fancy – every month they send you an assortment of goodies based on your profile. COUPON: Use coupon code FOLLOWUP10 to save 10% off your first box! The Products: $80+ worth of stylish products selected by Coco Rocha! I received a different Ciate collection in the Jennifer Love Hewitt Fancy Box, and I love these nail polish sets! In addition to the neon nail polish and caviar pearls, there is also a mini polish that makes your nails glow in black light! Notebooks are now officially in the category of things I will never buy again because I get them so often in subscription boxes! This power grid is a Fancy exclusive – and I hope they continue to do more exclusives in upcoming boxes! I think power banks are so useful for travel – and I love that this one lets you charge two things at once! Verdict: We paid $30 plus $7.95 shipping for this box (I have the original rate for this box since I subscribed with the first box), and this box has a retail value of over $110. I’m really happy with the value for the September Fancy box, and I think I’ll use every thing in this box – though I’m not sure when I’ll need black light nail polish! What did you think of the September Fancy Box? Ughh..I just switched my Fancy box from the regular (at the discounted rate by the way) to the Jennifer Love Hewitt box because I hadn’t been happy with the regular Fancy box the past few months. I am now regretting that choice due to the items you received in yours! BOO! I hope the Jennifer Love Hewitt box is as awesome this month. Hi Liz – I got my Fancy Box on Friday and LOVE IT! It is my first – after seeing your posts I had to go for it, and I was so thrilled with my first box. So much so that I also have signed up for Tyler Florence and Coco Rocha. My niece loves the black light polish (she is 19!) and I love the charger – how fun it is to be the cool aunt with all of our Fancy items. Thanks again for an outstanding site and for all the up to date info on all the latest boxes! Adore you and your reviews! Is this the Coco Rocha box or the regular fancy box? This is the regular Fancy Box. ok, great. I’m waiting on Coco Rocha!